Are you tired of yelling at your TV or computer when some idiot spouts off with a downright stupid opinion? Do you want to graduate from being a keyboard warrior and become a real activist – you know, the kind that actually makes a difference? Or do you already run or volunteer for a liberty organization whose membership is dwindling and needs new people – but you have no idea where to find these new liberty-minded individuals? Well, then, look no further – presented below is my incredibly powerful yet outrageously simple five-step formula for creating and growing your very own grassroots organization. 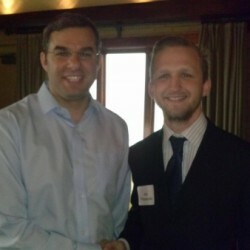 Using this formula as a Field Representative for the Leadership Institute I recruited over 1,500 people in two months – many of whom stuck around and created their own liberty-minded organizations. Why does your organization exist – or why do you want to start one? What is its purpose? Why should strangers you’ve never met before join your organization? These are questions you’ll have to answer before going to recruit for your organization. Your core offer should attempt to answer those questions, and it should be clear from your group’s name, purpose, mission, pitch, and marketing materials, what that core offer is. Sense of Community – Does your group hold meetings? If so, what kind of meetings are these, how involved do your sign-ups have to be, and how frequent are they? Is it a good place to make friends or to network? Many people will get involved in your group just because they want to be part of a community where they can make friends and feel welcomed. A good example of a group that is primarily a “sense of community” organization is Liberty on the Rocks – the only purpose of LOTR is to get a bunch of “liberty people” together for drinks, food, and a good time. Personal Benefit – How will your prospects personally benefit from joining your group? Could you delegate some tasks to them and give them a leadership role and title – something that they can put on their resume and make them feel important? Is your group more of a professionally-minded organization like Alumni for Liberty, where your members can expect to meet future clients, employers, employees, and business partners? Or maybe your group focuses on personal or professional development – like STRIVE does – and can offer the benefit of personal growth to its members? Ask yourself these questions and figure out how to incorporate the answers in your core offer. Social Change – This is the most obvious reason for creating and getting involved in the liberty movement in the first place – people don’t get involved in the liberty movement just for fun, profit, or personal growth, after all. So how will your group enact social change? Will you lobby your legislature? Will you attempt to inform and educate the public? Will you use confrontational mass-based tactics like protests, strikes, etc., to demand change? People want to feel like they’re a part of something larger than themselves – and this is your ticket to tapping into that feeling. The strongest, longest-lasting, and most effective liberty organizations offer and deliver on all three of the above reasons – so make sure you incorporate these into your core offer. Now that you know your organization’s purpose and core offer you need marketing materials that convey that information to your prospects. At a bare minimum you need a branded petition or sign-up form, rack cards (or brochures), and a sign. The sign is better if it’s hand made (it looks more grassrootsy), but the rack cards and sign-up forms need to look professional, clean, and concise. Remember: more is not always better when it comes to marketing yourself and your group. You want to drive home one core idea to your prospects in your pitch, something simple and easy to remember, like “we’re for free speech” or “we’re for more personal and economic freedom.” They should be able to go home and remember exactly what you told them. Just remember: when crafting your pitch and marketing materials, KISS it, keep it short and simple. However, this does not mean that you need to be a minimalist. To the right, you can check out my standard tabling set up when I go recruiting. 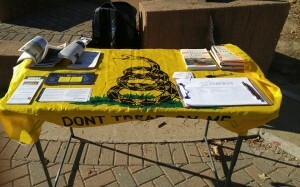 As you can see, I use a plastic folding table ($40 at Walmart) and a Gadsden flag as my table cloth. 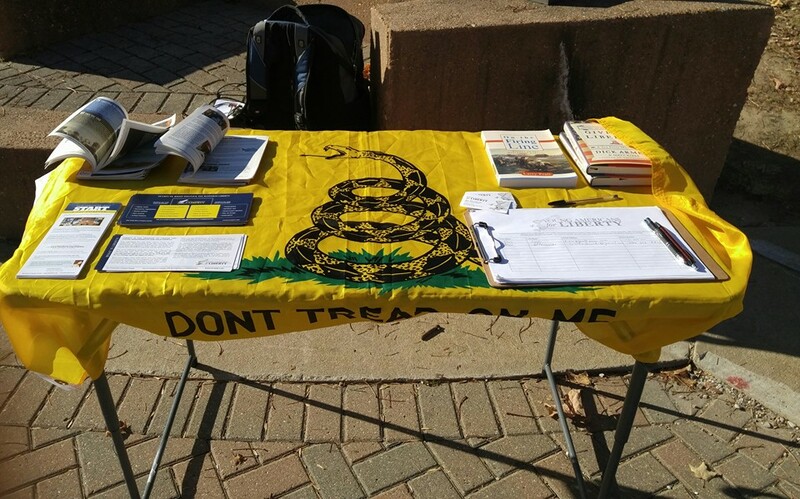 Using the Gadsden flag as a table cloth carries with it two benefits: (1) it is a blatantly partisan symbol, a “lead magnet,” which will attract the right kind of people to your table and instantly turn off everyone you shouldn’t be talking to, and (2) the Gadsden snake fills out the table nicely without making it look cluttered. 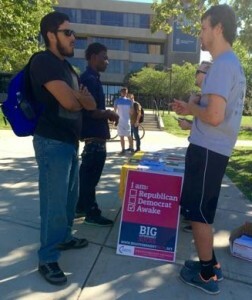 In addition to this, you can see my sign-up forms, business cards, books, rack cards, and pamphlets on the table. All of these materials make the table look “full” – and the more expensive stuff (e.g. pamphlets, books) are good “gifts” to give to prospects who are very interested in your organization and excited about joining. Now that you have everything planned out – from your core offer and pitch to your marketing and recruiting materials, you’re ready to go to places that have people! Noticed what I said there: you want to go to places with people. You can go knock on doors and cold call a voter list, but that’s tedious, low reward work. Don’t get me wrong – canvassing and calling are great for many purposes, but for the kind of high volume recruiting you’re looking to do, they’re low reward work. You’d be much better off going to a meeting of your local Republican Party, Libertarian Party, Tea Party, or City Council – places where you might find people interested in your group (the events you crash depend on the type of group you’re running). Short of that, you should plan on going to events like parades, local celebrations, student organization fairs, open-air farmer’s markets, college campuses, tailgates, or anywhere else where large groups of people congregate and walk around. Make sure you look at community calendars and, if you have to, reserve a table or a booth at events ahead of time. 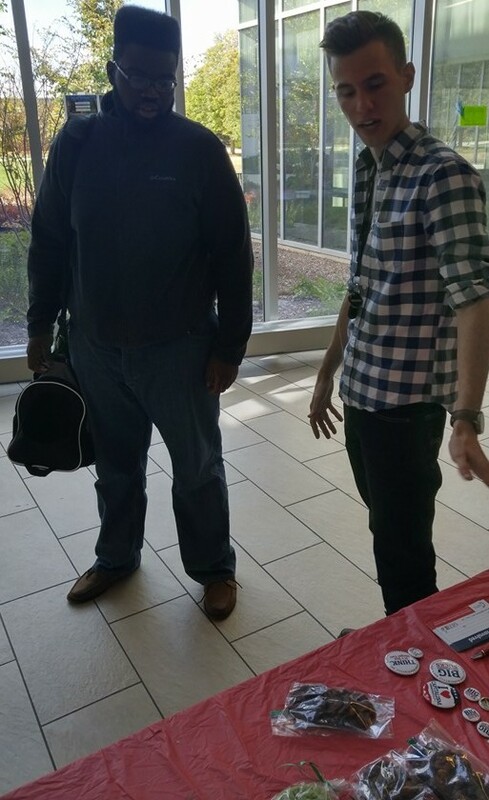 This also helps you plan for your recruiting event and find volunteers to help you throughout the day. You have your table set up, you have your marketing materials and your sign up form set up on your table – now what? 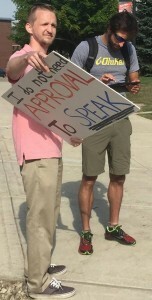 If you answer “sit down” or “stand behind my table” or “quietly hand out flyers” or anything other than “attempt to engage every single person who walks by” then your answer is wrong. If you’re “shy” or introverted like I am, now is the time to swallow your distaste for face-to-face interactions with other human beings (trust me – I know how it is) and attempt to engage every single person walking by. There’s two reasons for this: (1) this approach works and (2) you’re a human being, not a table or a sign, so don’t expect your table or sign to do all of your work for you. If just setting up a table with a pen and sign-up form worked, then you’d have tons of sign-ups and you wouldn’t feel the need to read this article in the first place. So remember: the key is to engage every single person who walks by. There’s a reason I keep repeating these words – they’re important to remember! Anyway, engaging every single person who walks by starts with your SEE Factors – smiling, eye contact, and enthusiasm. It should go without saying, but if you act bummed out or waaaay too serious, or if you frown or refuse to make eye contact, people won’t interact with you. It’s that simple. Also, don’t worry about being awkward – if you stare at a person’s face long enough they’ll eventually look in your direction and make eye contact. So once you’re making sure that you’re smiling, attempting to make eye contact with every single person who walks by, and being all-around enthusiastic, next you have to hook your prospects. Your “hook” is your question that you ask every single person who walks past you (yes, even those who continue walking without acknowledging your existence). For example, the generic question I use when recruiting for Young Americans for Liberty is “do you like liberty?” When recruiting for a pro-gun group, I ask “do you like guns?” When circulating a pro-free speech petition I ask “do you like free speech?” You get the point. Once you ask your question you have to shut up, smile, and look expectantly at your prospect – you just put the ball in the prospect’s court and now it is his or her turn to respond. If they just laugh you off and walk off, then you can let them go. If they power walk away from you, you can let them go. But, when someone inevitably responds (and a sizable minority of people will respond) you launch into your short one or two sentence pitch, reel them in to you and get them to sign up. This is a number’s game. At the end of the day only a fraction of people you try to “hook” will sign up. Don’t take it personally when people ignore you or refuse to sign up. Every “no” gets you closer to a “yes” – closer to someone who will want to be part of your group. Strike the iron while it’s hot. 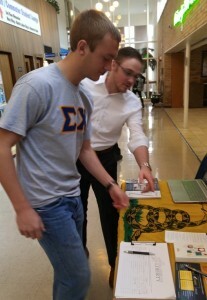 Lastly, and most importantly, once you sign up new members you have to strike the iron while it’s still hot. Don’t let the people you signed up forget about you or change their minds about joining before you contact them again. Follow up with your prospects as soon as possible and invite them to get involved in your group in some way. You can do this via email, text message, or snail mail – but, of course, the most powerful method you can use to communicate with your members (besides face-to-face contact) is to get them on the phone. Invite them to a meeting or an activism event, get them to introduce themselves to your established group members and give them time to chat, socialize, and get to know one another. This will build the sense of community that people crave. Once they feel welcomed and accepted by your group, your new members are much more likely to stay and continue attending events. Once you get your new recruits engaged in the community that exists within your organization, you’ve already won half of the battle. People will continue coming back to your meetings just to catch up with one another. Then, when you combine this sense of community with a purpose that fulfills the needs for personal benefit and social change into your group meetings, you will create a vibrant, self-sustaining, and effective organization.